It’s a fact that the food we consume significantly impacts our health, and in many cases can control and even reverse nutritional diseases such as Type 2 Diabetes. While most people realize this, often those at the most significant risk from nutritional diseases are not able to afford, or have access to, the foods they need. 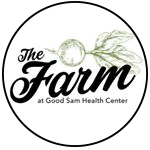 For that reason, located in the heart of an area of Atlanta officially recognized as a food desert, The Farm at Good Sam is working to reverse that trend. The fruits and vegetables produced will soon be contributing to the Full Circle of Health and available at The Market at Good Sam. Georgia Food For Health (GF4H) Program promotes affordable access to fruits and vegetables and healthy eating in under-served communities. Through the program, our healthcare providers give families innovative prescriptions that can be spent on fruits and vegetables at The Market at Good Sam. The Market is now open Monday-Thursday, 9am-2pm.